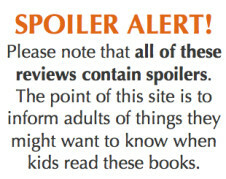 These guidelines are for adult reviewers. You’ll find guidelines specific to kid reviewers here. 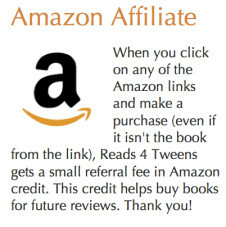 Reviews for Reads 4 Tweens serve a specific purpose, which is to help parents and educators make informed choices about books for their kids. If you’ve read a lot of the reviews on the site, you probably have a good idea of what we’re looking for. But here it’s broken down, which lets me spell out some of my own assumptions. The primary question to keep in mind is “What content and themes do you think adults might want to know about?” Often those are warnings (graphic violence, bad examples that seem acceptable in the book, implied adult themes, conscious or unconscious -isms like racism, sexism, colonialism, what have you) but they may also be things that are handled well—lessons well taught, main characters who make good choices, avoidance of the expected stereotypes, etc. Gut reactions based on your own experiences, your own kids, and other parents and kids you know are totally valid. This is a lot to keep track of! Especially if you’re providing specific examples, which I hope you will (remember that spoilers are encouraged, as often those are exactly the kinds of things adults wish they knew about). Personally, I keep a notebook nearby while I read so I can jot down notes as I come across things I’ll want to remember later. Age recommendations are based primarily on content and themes and are necessarily guesses. Typically, twelve year olds can analyze ambiguous morality and tough choices better than eight year olds can. Older readers are less likely to be affected by some graphic violence and may even appreciate some romance. The review provides the reasoning so other adults can make informed choices based on the individual child. Books for precocious readers are books that have a reading complexity that’s higher than the maturity of the content. For instance, a 200 page book with complex sentences that isn’t terribly violent and doesn’t contain betrayals and emotional abuse might be a good candidate for precocious readers. Books for reluctant readers might have a visual component that adds to comprehension and breaks up intimidating blocks of text. They might be fast paced and plot driven, preventing interest from lagging. They might be on the short side but have content that isn’t too childish and will appeal to older readers. A surprising number of books are simultaneously good for precocious and reluctant readers. Good read alouds may have content that will appeal to younger kids but a complexity that might frustrate them without help. Read alouds might have topics that adults might want to discuss with kids. And some books are just written in a way that begs for voices and sound effects! There’s no strict format of what categories get included; that all depends on the book. So basically, quick overview of the story, header of “Things you might want to know before suggesting this to your kid,” and then spoilers galore of things that parents and educators might want to know—both positive and potentially problematic—when a kid reads the book. It ends with a recommendation that should include things like age range, whether it might appeal to reluctant readers, whether content is appropriate for precocious readers, if it’s especially well suited to read aloud, etc. Brief overview—a sentence or two about overall plot, whether it’s funny, sad, emotional, etc. Use any of these that are appropriate, each pulled out as section with a header. However, these are only guidelines—skip anything that doesn’t apply to your book and create categories for anything you want to mention that doesn’t fit what’s here. This is a good place to suggest ages, based on content and readability (yeah, you’re guessing. That’s ok). What kinds of kids might like this (if they like this or this, avoid it if they don’t like this). A short bio of you. This will be included on the Guest Reviewers page and gives readers some insight into things that might influence your ideas about books. Are you a parent/teacher/librarian/author—i.e., how do you interact with kids and why do you care what they’re reading? What are the ages, interests, etc. of the kids who influence the books you look at? What kinds of books do you typically like to read? 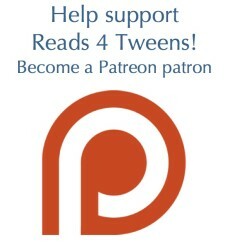 Submit the review to me through email (ayvalentine AT reads4tweens DOT com). I’ll do some copyediting and formatting, ask you any questions I have, and when we’re both happy with it, I’ll post it. I’ll email you the day the post goes up. It will also be announced on Twitter, Facebook, and Google +.